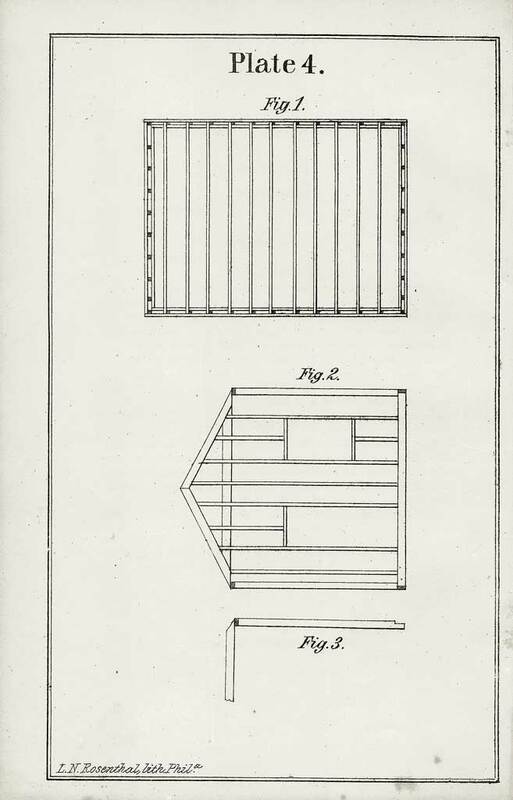 A good pair of winding lath or winding sticks is sometimes hard to find — I suspect not many survived the burn pile. The good news is that a new set is easily made in an few minutes at the bench. Why would I want a pair of ‘Winding Sticks’? What do they do? 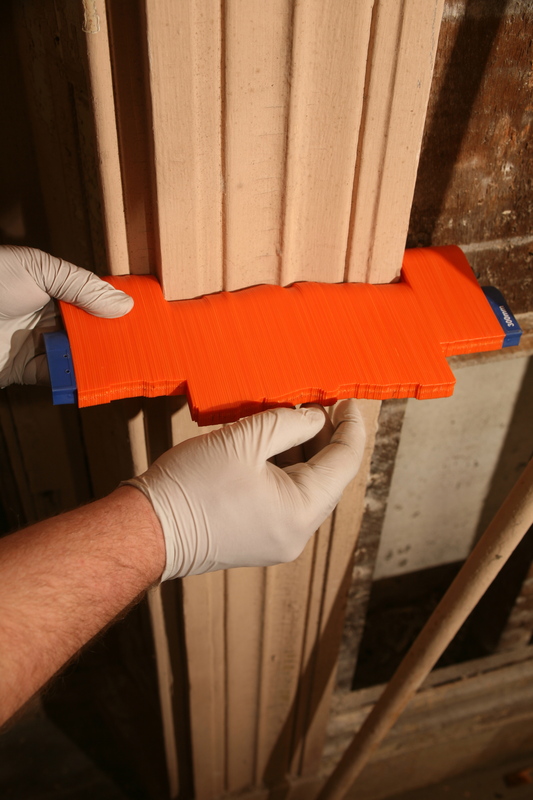 This pair of matching straight-edges are a fast and invaluable tool that allows you to quickly see if a board is flat. By placing them at each end of a board, sighting down across the near stick and looking at the far one, you can more easily see any twisting or warping in the board. 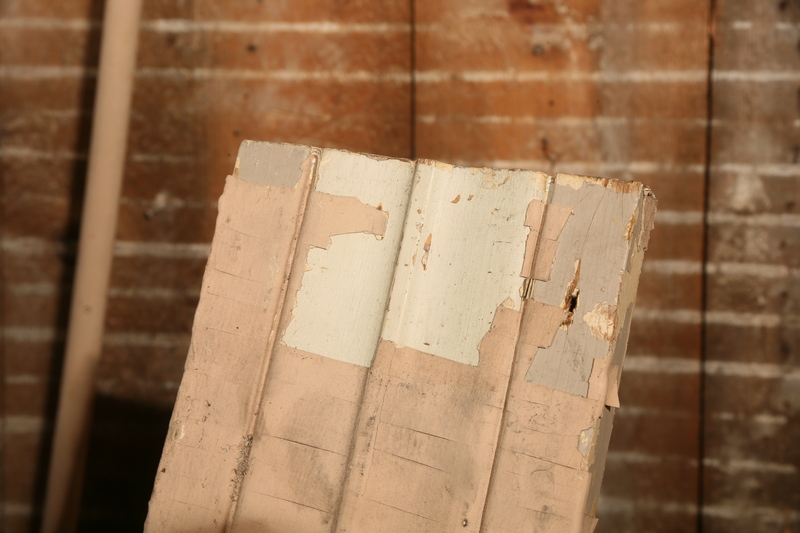 The sticks help accentuate any non-planer surfaces. By moving one stick and sighting the board at a few locations along its length, you will quickly see how the board flows. 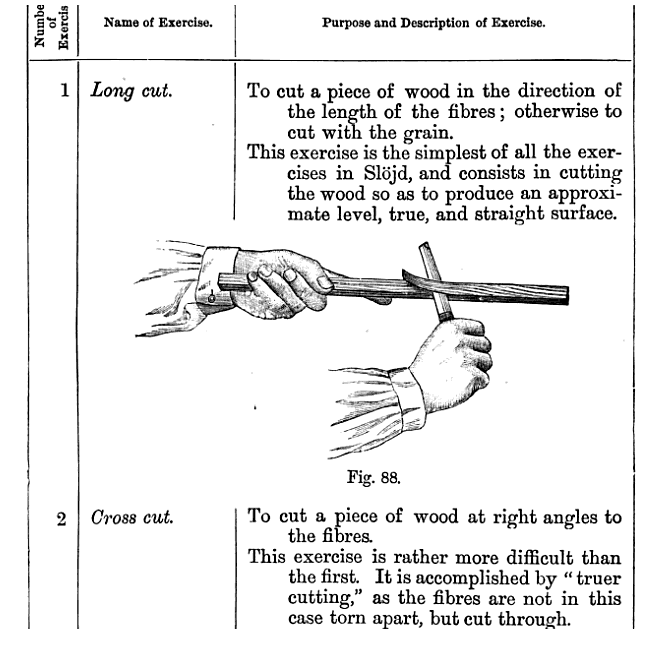 Using a single stick you can also check for any cupping or warping as you would with any other straightedge. 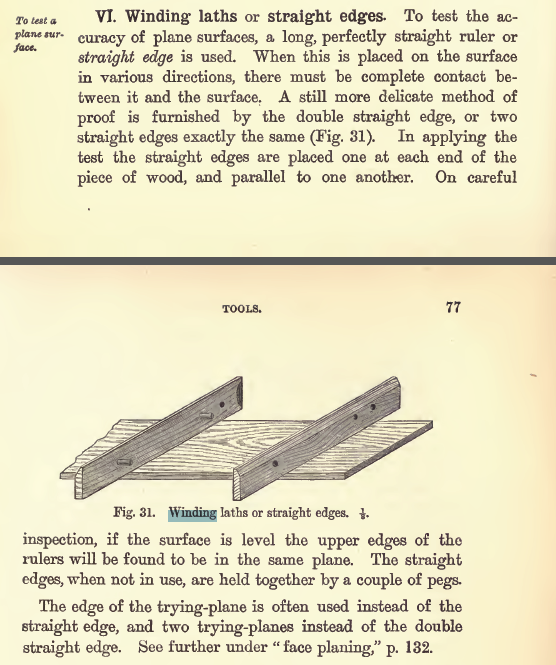 From Otto Salomon’s ‘Teacher’s Handbook of Sloyd’ above you can read a nice description for how to use winding laths efficiently. The pair of wooden Sloyd winding laths shown above nest with each other via a set of fitted wooden pins and have a nice relief one the edge of the short sides so you can easily get a finger hold in there and separate the sticks when you want to use them. Otto also calls out an interesting alternative you can use in a pinch — by turning two try-planes on their side you can use them as an impromptu set of winding sticks and sight across them. The next time you are out in the shop, make a quick set of winding sticks and see how much it can improve your board flattening efficiency. P.S. If you don’t have the the time or scrap to make your own set from wood, and don’t have 2 jack or try planes handy, you need to have a stern talking to, but there are commercially available winding sticks available from Lee Valley and others. I admit that I do have a pair of the Lee Valley aluminum winding sticks which I bought when I first got started in hand tool woodworking. They are well machined and the design hits all the major tips called out above — with the exception of being made of wood of course. Much like the shop made winding sticks, these aluminum sticks work well and need virtually no maintenance. P.P.S — This is an extended version of a post I put together for my friends at Popular Woodworking on the contributor’s blog which can be found here. What does your tool chest say about you? The spartan exterior of many traditional tool chests was as much a security system as it was a design element. When closed the clean lines and rugged exterior looked did not draw your attention and looked much the same as many other stoutly built traveling chests and trunks you’d see on a given day. While unassuming in travel or quietly sitting in the back of the shop, many of these chests contained a far more interesting interior. Beyond just a safe and secure place to store your tools, the way you build and customize your chest says a lot about you and how you work. A clean and orderly chest, worksite, and truck can be a great advertisement for the quality of work you do. 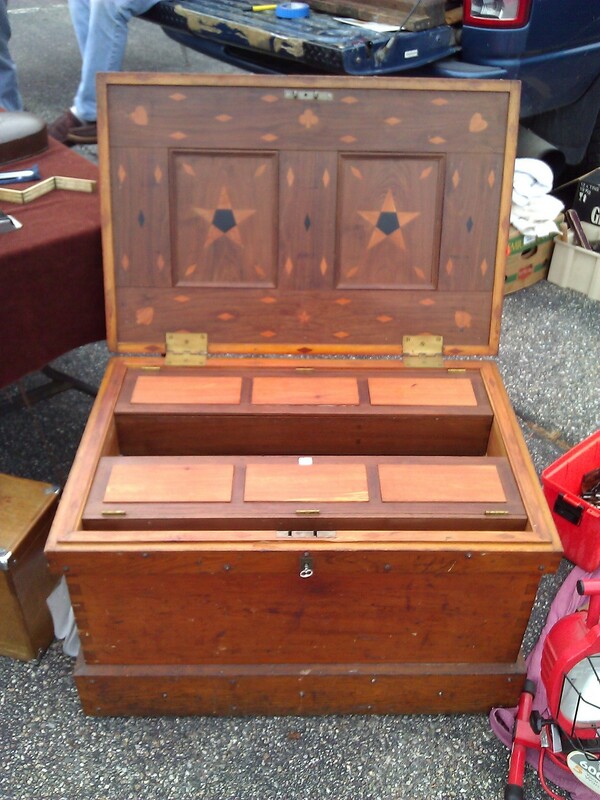 I’ve found folks are drawn to a nice chest like moths to a light bulb. What do you look for in a solid chest? 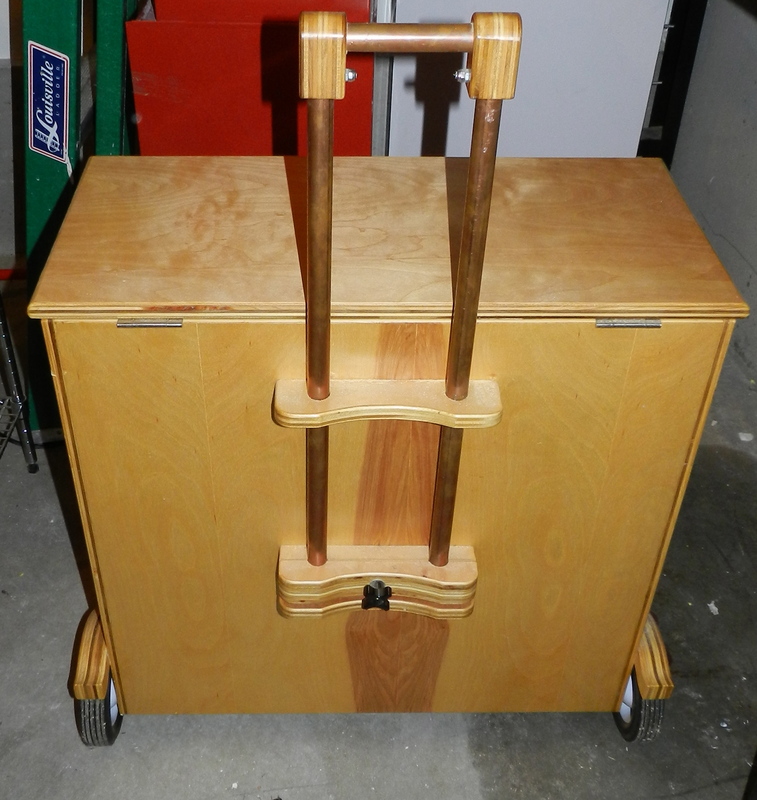 When I built a traveling toolchest for my own work I went with a utilitarian design that functioned much like rolling luggage of today. Inside there is a tray on top, a series of removable drawers to hold planes and small items and some open cubbies that were easily accessible and could be secured behind locking doors. The heavy chest lifts, telescoping handle and wheels make it manageable to move. The drawers can be swapped out depending on the needs of the current project and I could vary the height as needed — having a double deep drawer etc. The above principles guide me as I build my own tool chests I and I hope they will help you as get out into the shop and build a chest that is a reflection of your woodworking skills and personality. 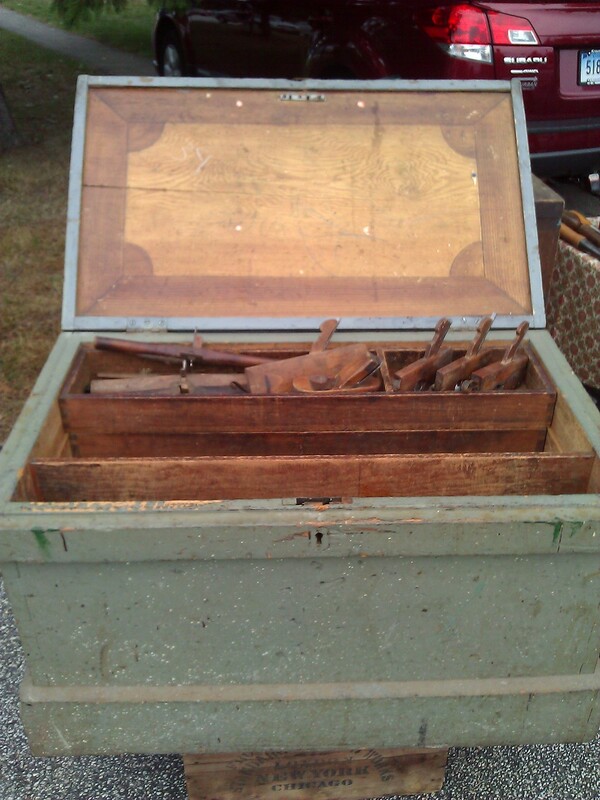 You can learn more about my thoughts on Tool Chests on my blog here. P.S. 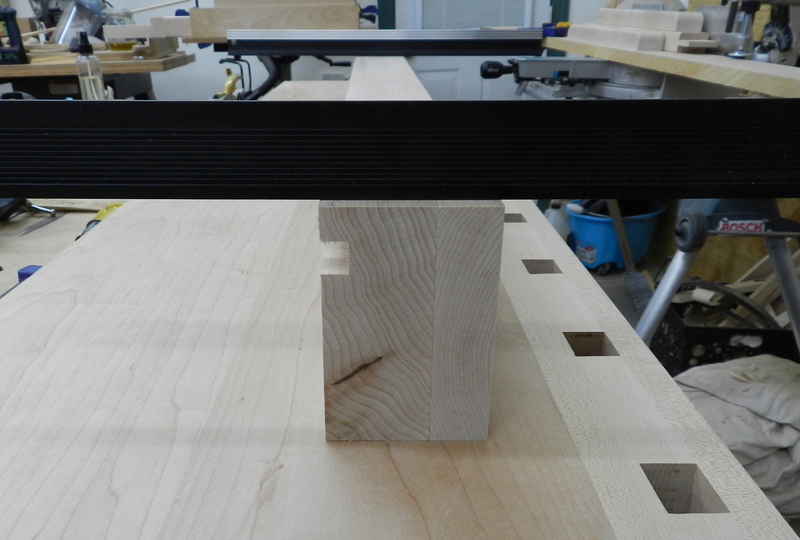 The above post is an extended version of what I wrote up for my friends over at Popular Woodworking as part of their Daily Woodworking Blog which you can find here. 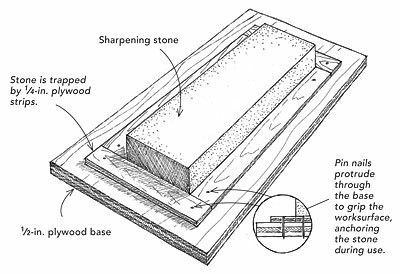 The post below is an expanded version of a recent post I made for my friends at Popular Woodworking which can be found here. For the sake of continuity on the series related to Sloyd on this blog I am providing an extended look at this topic. In honor of American Independence day this past week, why not do something that makes you a little more independent? 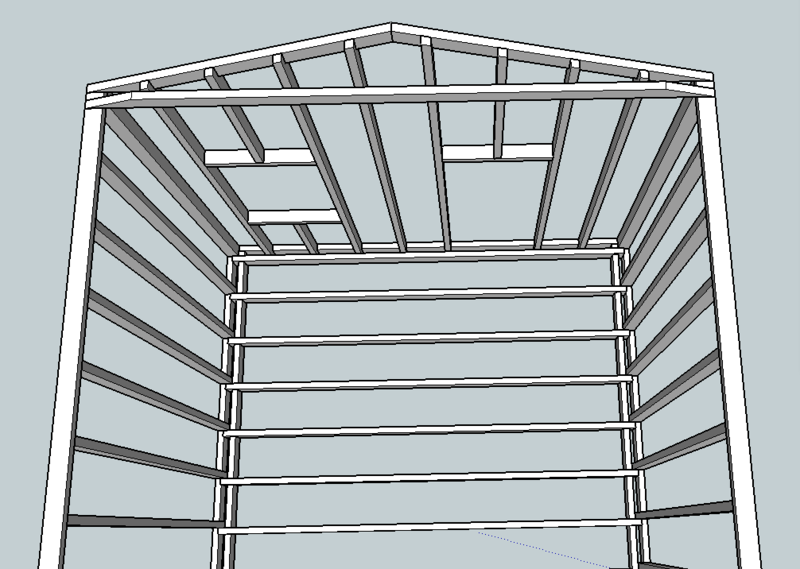 When I started out woodworking I’d watch television shows and read magazines pushing all kinds of fancy new tools and think ‘If only I had a shop full of those tools I could build anything’. I spent a long time saving my pennies, reading the reviews and trying out the latest tools. The models seemed to change with the seasons. New project? Time for a new bit or jig or gizmo. Realizing that earlier craftsmen didn’t have access to all of these modern wonders yet they produced far more intricate work, I went in search of the hand cut dovetail and the arts and mysteries of our ancient craft. I quickly found that power equipment was not broadening my capabilities as much as it was like an anchor tethering me to a limited band of work and taking up valuable shop space. I also didn’t like wearing the requisite dust mask, hearing protection and safety glasses all the time — it was like a mini sensory deprivation chamber. 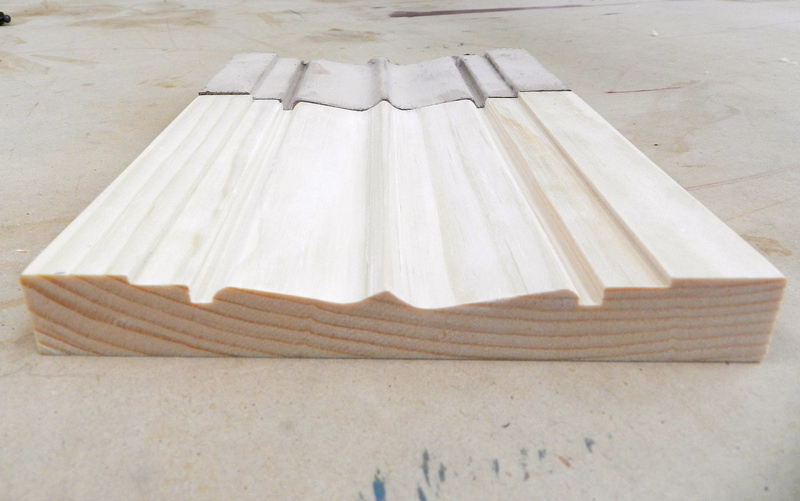 When I asked master cabinetmaker Dan Faia (NBSS) what he does for dust protection in his own shop, his succinct reply was “I never coughed up a curl“. That pithy remark reflected the very different view traditional woodworkers have — without all the big machines, the dust and noise, you can focus on the work, invest in a smaller set of high quality tools that should last a lifetime and enjoy the process as much as the result. What is a good minimum set of tools I need to get started? How much is this all going to cost me? 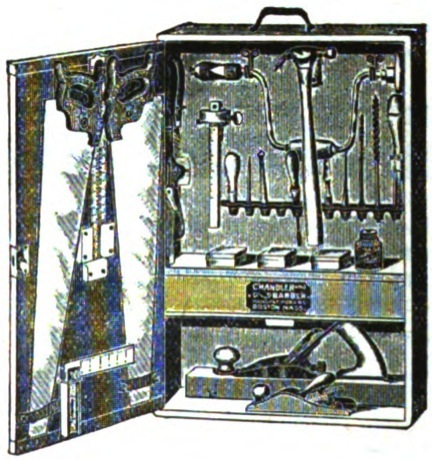 In researching the Sloyd tool cabinet shown above I found some old tool catalogs from Chandler and Barber of Boston (a primary supplier of Sloyd paraphernalia including the Larsson benches etc ) including one from 1900 complete with a listing of and pricing for all the tools in the cabinet. 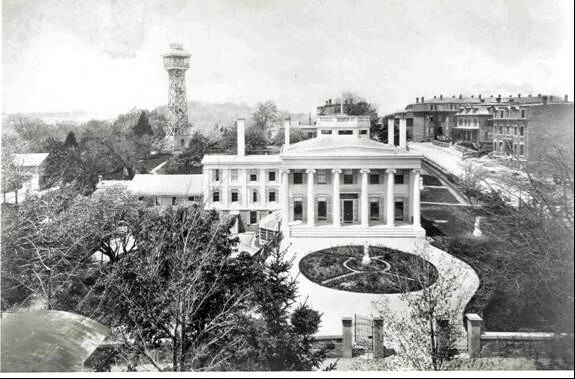 According to the Federal Reserve’s website $1 in 1900 that should be worth about $27 today. A straight monetary conversion doesn’t paint a complete picture since some tools that were common back then are a specialty today and vice versa so I also included a column showing what an equivalent quality tool would cost new today. 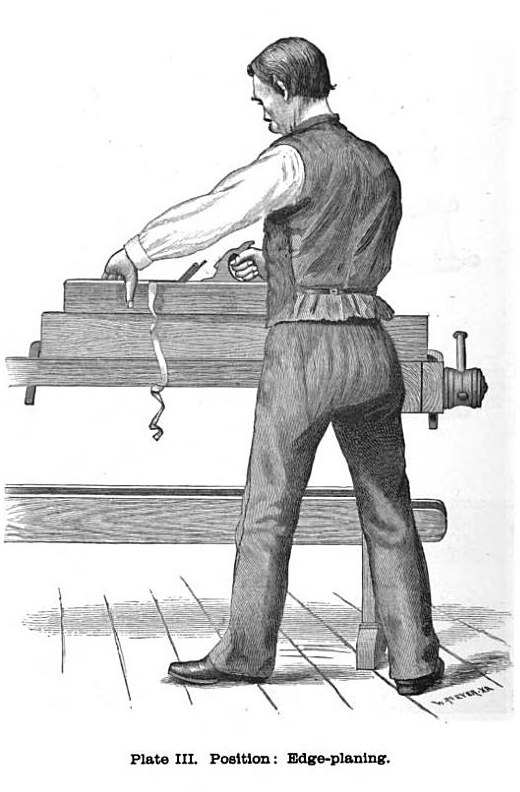 In 1900, just as it was when I was a student over 100 years later, the view is that it is better to buy a quality tool once that will last a lifetime than buy something of poor quality which will not serve you well in your work. Keep that in mind as you review the list — since the tools were not the cheapest back then and surely are not the cheapest today. But with this modest set of tools you can build an amazing array of projects just as many ‘Sloyders’ (Sloyd school students) have done before us. If your wallet still cringes at the totals above, fear not, for the totals above are for all brand new tools. 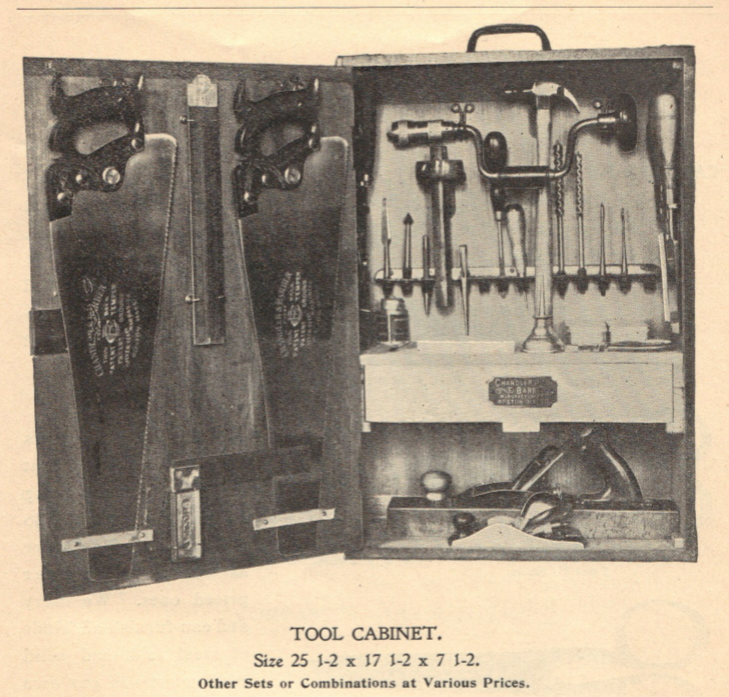 The one luxury we have in our modern day of hand tools falling out of favor is the large secondhand market where you might be able to scoop up some great tools — possibly even some of the actual tools that once inhabited these cabinets for the original price in today’s dollars or less. 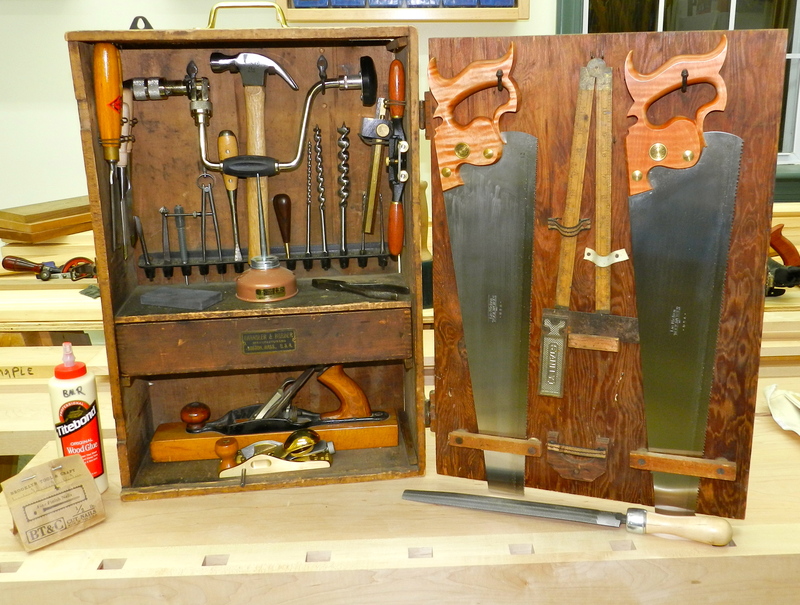 So before you break out the barbeque, give some thought to how you can free yourself from a mountain of modern tools and invest in a modest set of traditional hand tools that will get you started on the path to more enjoyable woodworking. Note, the table above is expanded to show what sources I pulled my current pricing data from — which may be controversial to some — but was a best effort to identify similar makes, brands, qualities and countries of origin to be the same as what was in the original cabinet. For items no longer made in the U.S.A. I tried to find the next closest replacement. P.P.S Why did the relative price of new tools go up so much? This is a topic we’ll explore more in a future post, but for all the armchair economists looking to convert see what a dollar was worth in the past, this site from the FED was interesting. 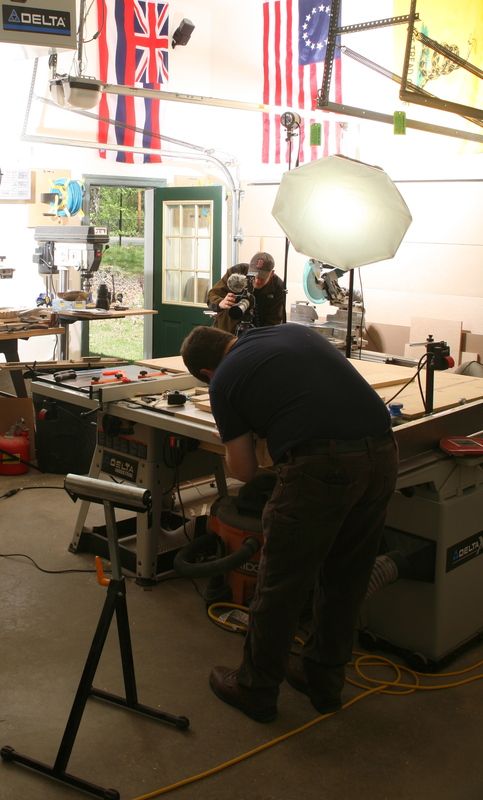 I recently had the opportunity to make a post to the Popular Woodworking online community which is edited by Dan Farnbach the PWM online editor. 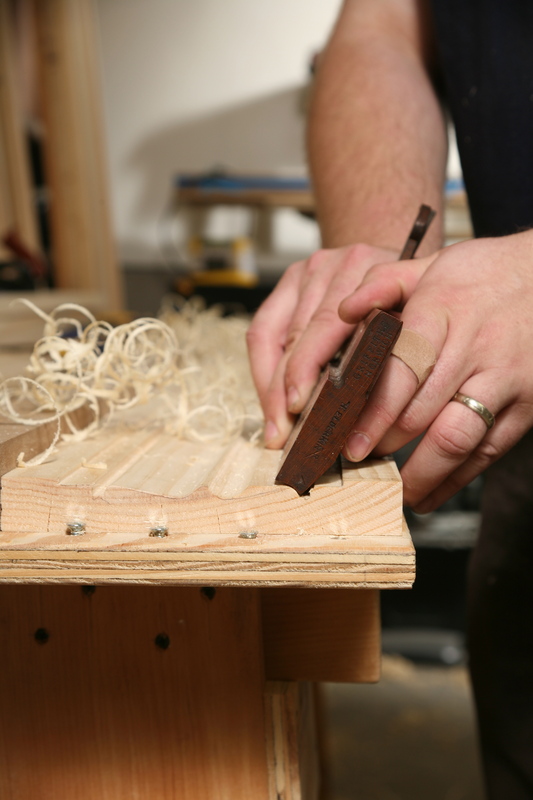 Bill Rainford is a young and driven craftsman in whom I think you’ll find a lot in common. 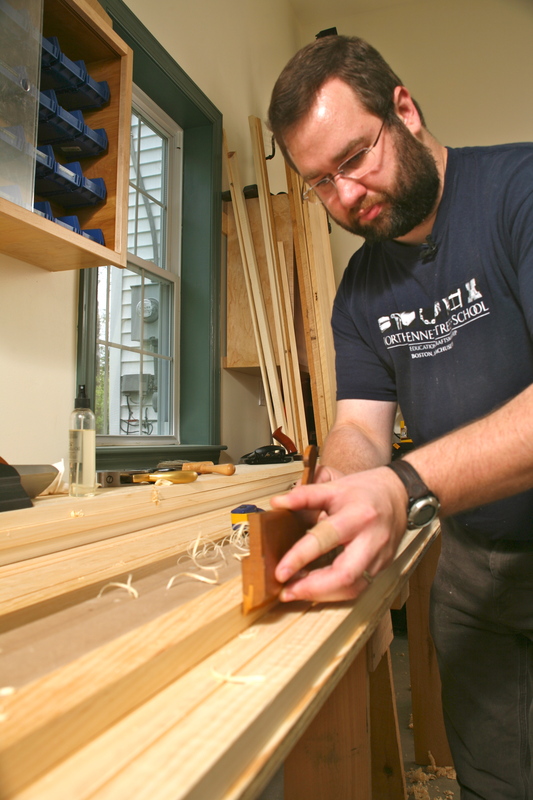 Voraciously self-taught at first, Bill went on to graduate from the Preservation Carpentry Program at one of New England’s premier craft schools. 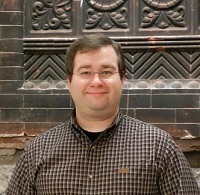 He now teaches workshops at that school (North Bennet Street) and serves as adjunct faculty at the Boston Architectural College, in addition to developing his own body of commissioned work, building his blog and holding down a day job in software. I want to welcome Bill to the community as an occasional guest writer. 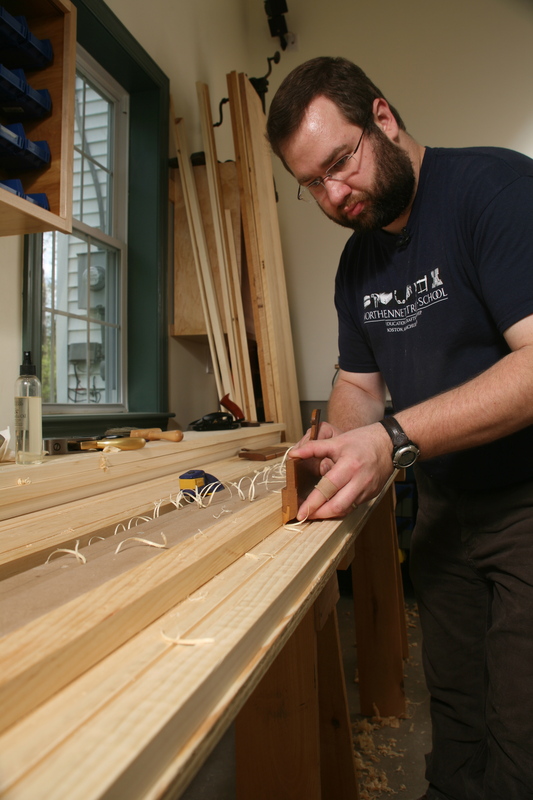 He’s going to bring us a little history and several techniques from his area of expertise, which he describes as traditional joinery –though Bill’s skills do not fit neatly in just one category. We may also do a project plan over the course of the next few months. Please welcome Bill by reading this newsletter and then visiting his blog! Of particular interest is Bill’s recent collaboration with Roy Underhill – more on that at the bottom of this e-mail. 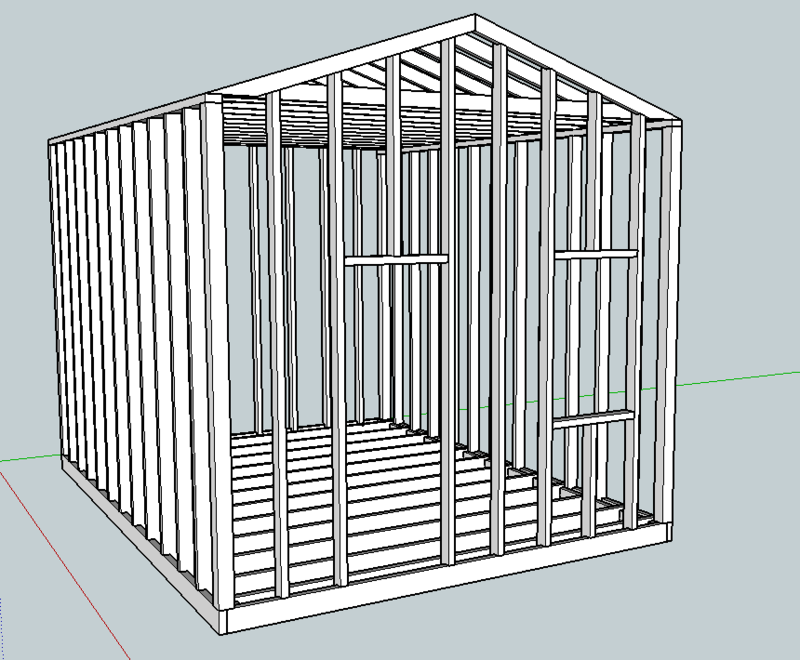 Part of what made my training in preservation carpentry so rewarding was the way in which it was taught. We followed a system of educational handwork derived from what was originally developed at Nääs in Sweden and known as the ‘Educational Sloyd System.’ Sloyd is the Swedish word for ‘craft’ and most commonly associated with skilled manual craft work. 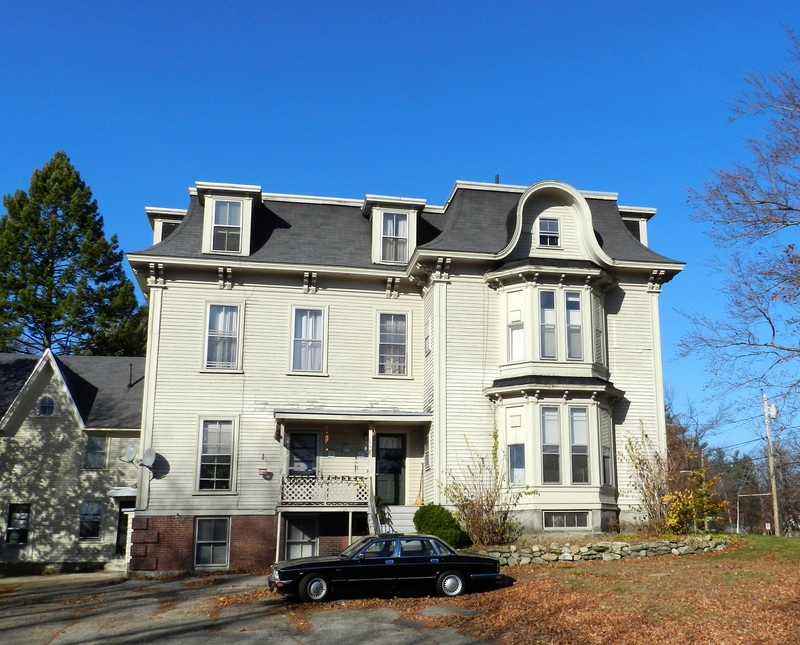 In the early years of the school in the late 19th century, there was a strong need in Boston and America as a whole to help new immigrants learn the skills needed to acclimate to this new country and develop skills to support oneself. This Sloyd System trained students by building a series of useful models/items each of which introduced basic tools and skills, built confidence to tackle more advanced work, and fostered the ability to evaluate your own work and push yourself to reach new levels of accomplishment. When Otto Aaron Salomon wrote ‘The Theory of Educational Sloyd‘ (page 7) he described the goals one should strove for in teaching and learning within this system. The goal of all this training was not just to help find a job, but to help round out the person. Students may never pick up a tool again, but they will forever have the knowledge of how to make and evaluate things with your hand and your eye and appreciate the labor of others – something I often feel is lacking in members of my generation. From this most basic of exercises students are able to make usable objects like a pencil sharpener, letter opener, penholder etc. which they are able to keep, evaluate and use. As the training progresses the students will have more freedom to implement their own designs and apply the skills they have learned. This sort of learning by doing, ability to be self critical, self-sufficient, and continually push oneself is still present at the school. In the current programs at NBSS students work under the supervision of a master craftsman who will start with the basics and guide students through their training. By the end of the 1, 2, or 3-year program, depending on major, students will demonstrate proficiency in many tasks, and while there is always more to learn they will be well situated to seek out and tackle the next big project. After graduating from my training, I remained interested in Sloyd and did further research on the topic. 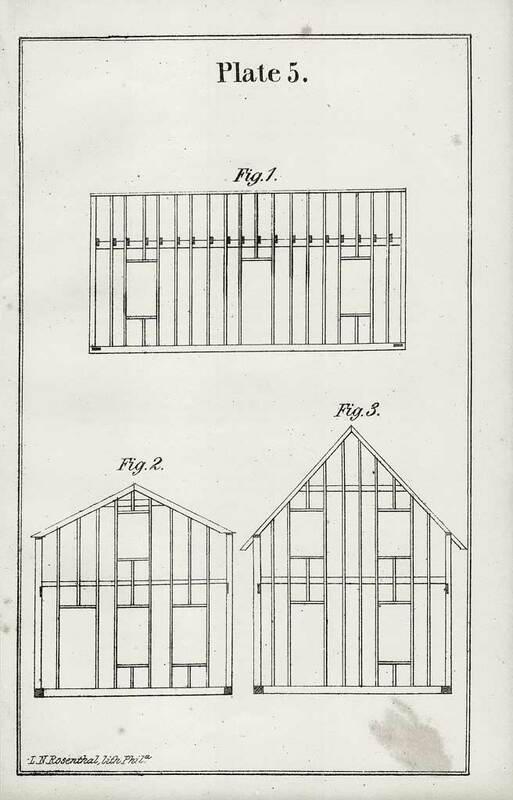 I learned that many of the benches and hanging tool cabinets designed and produced for early Sloyd programs were based on the designs of Gustaf Larsson of The Boston Sloyd School and produced locally in Boston. 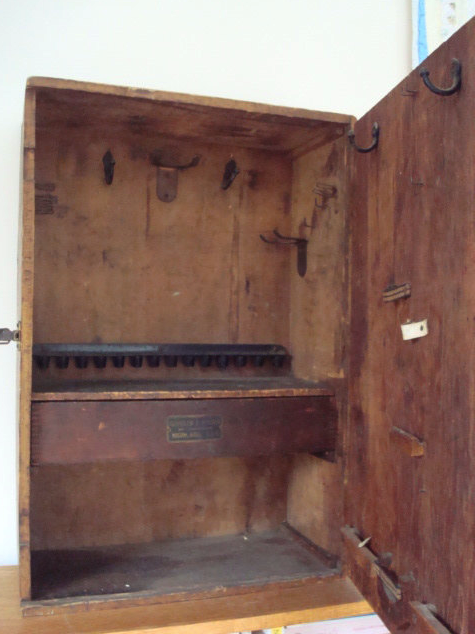 Some of the benches are still in use by the school and you can find some second hand every now and then on eBay, but the hanging tool cabinet was news to me. 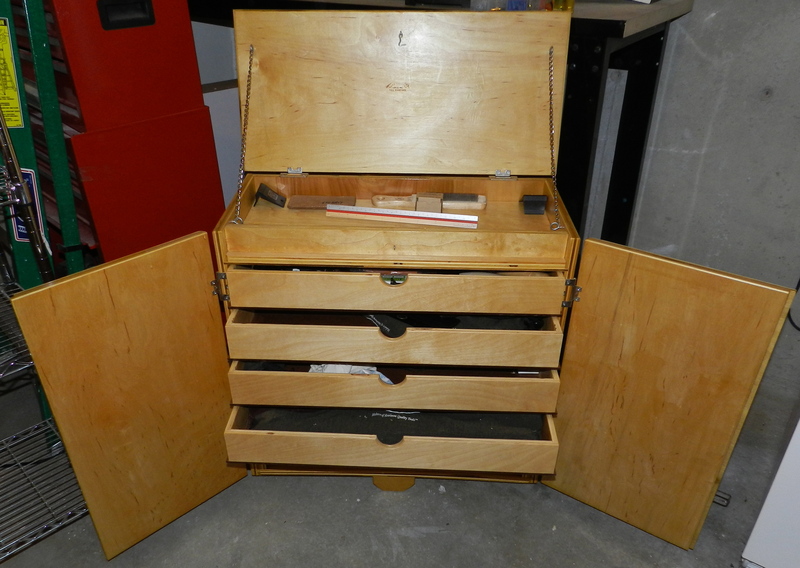 Shortly after learning about the Larsson tool cabinet I made a serendipitous discovery at a local pawn shop in New Hampshire – I actually found one of these cabinets and in very good shape given its age. 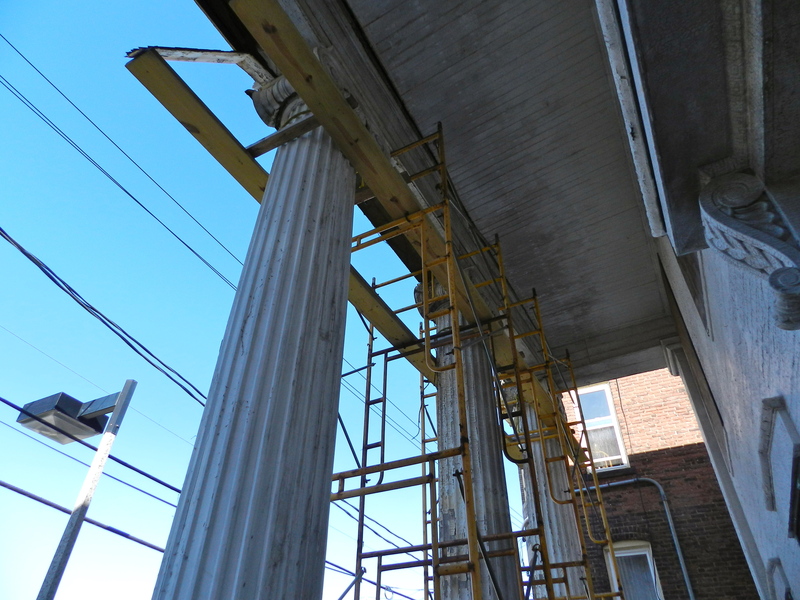 All the hardware was intact, and only the front door was rebuilt. It was clear that this cabinet was used for a very long time by someone who cared about it, as the replacement door inherited the hardware and layout of the original. 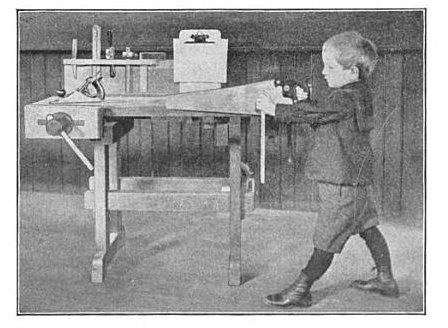 I am working on a reproduction of this piece, and will be presenting parts of that project here and on the Popular Woodworking blog. Future posts will include a bit on how the cabinet was made, interesting details on the tools that once inhabited this cabinet, as well as notes and prices on modern equivalents. If there is interest I will also make some explorations into some of the Sloyd exercises which can help improve your own hand skills. 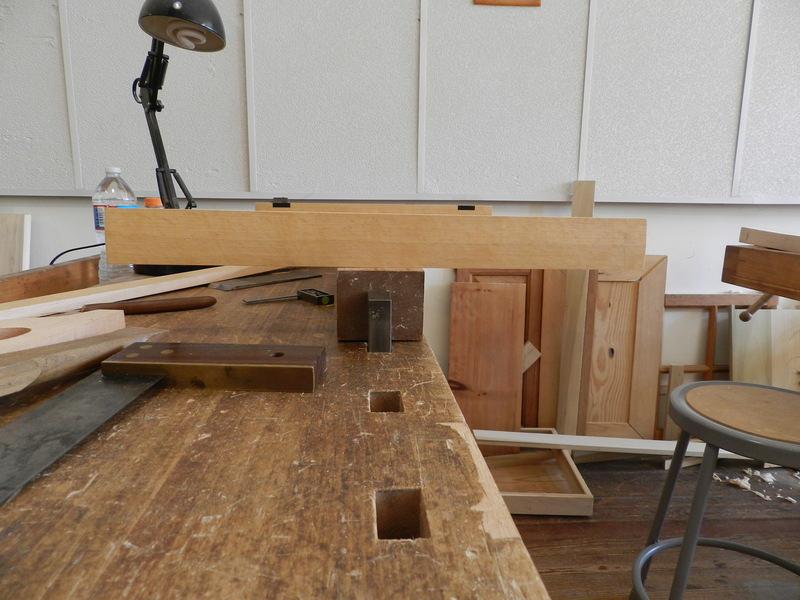 If you’d like to join me in re-connecting with the joy of our ancient craft of woodworking I will be taking some classes at Roy’s Underhill’s ‘The Woodwright’s School’ in Pittsboro NC this July 9-12. 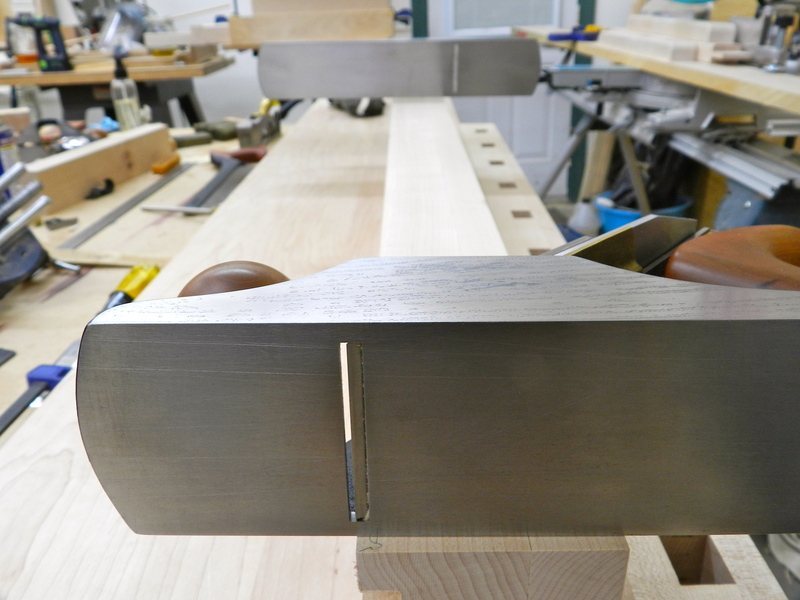 The first class is Making a Traditional Jointer plane with Bill Anderson and the second class is Making a Traditional Metal Namestamp with Peter Ross. 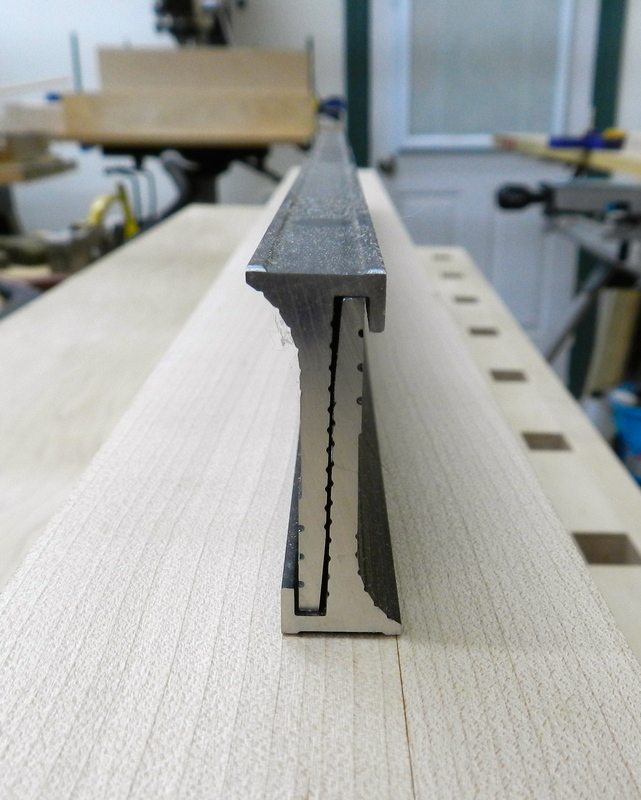 Both of these classes are a great way to learn some basic Sloyd skills and experience the satisfaction of using a high quality tool you made yourself for years to come. If you’d like more information on one or both of these classes, please check out my post on this topic here. If you are interested in attending, please do not wait to sign up — there is a minimum number of students needed to sign up by mid-June in order for the classes to run. Late last night I got home late from the EAIA Annual conference down on Cape Cod — we had a great time at the event and I will post on that more this week. Below is a picture from this small article, but if you want to see all the details, please check out the magazine on your local newsstand or view this tip online here. Stay tuned for next month’s issue (August/September 2013) — I have a much longer piece with online video components coming out in with that issue.